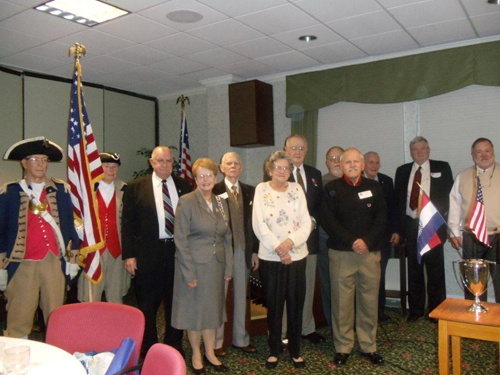 The MOSSAR Color Guard is shown here participating on Monday, December 5, 2011 in a Holiday Luncheon commemorating the 70th Anniversary of Pearl Harbor. The luncheon was held at Kingswood Manor in Kansas City, MO. The guest speaker was Rear Admiral (Ret.) J. Stanton Thompson. Left Photo (L - R): Major General Robert L. Grover, MOSSAR Color Guard Commander; Compatriot Al Paris, and Compatriot James L. Scott. 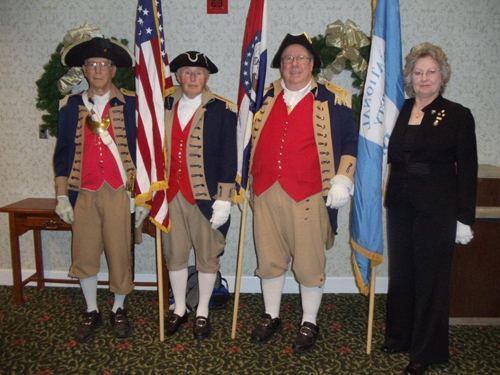 Right Photo: Major General Robert L. Grover, MOSSAR Color Guard Commander and Compatriot Al Paris.